Sid Boyum was a longtime Eastside Madison resident, an artist, sculptor and eccentric. After he retired from a career as an industrial photographer, he filled his property with a profusion of works, primarily in painted concrete, that range from the whimsical to the darkly outrageous. 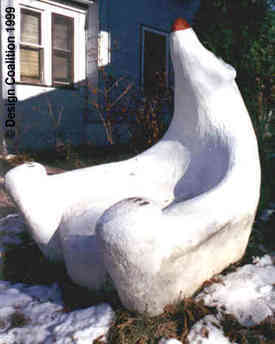 The best known is the Polar Bear Chair in his front yard. It leans back on it's haunches to form a concrete lap to sit on. One of the neighbors on Sid's street says he created the Bear for the kids in the area - so they wouldn't keep climbing on his other pieces! A neighborhood committee worked with Sid's artist son Steve to relocate some of the sculptures to area parks, along the neighborhood bikepath, at the grade school and other public streetside sites. Pictures of Sid's work were displayed in our storefront window during the community voting process. You can see some of the photo mock-ups of Sid's sculptures that the neighborhood voted on. Steve Boyum offered many of Sid Boyum's nearly 70 pieces of folk art sculpture for sale, with the proceeds going directly to an endowment fund for the restoration and maintenance of the pieces located in public places. With Steve's recent death, Sid's sculpture is no longer for sale. You can still see the Sid Boyum Sculpture Catalog to enjoy the pieces.